Last week, the Old Town Soul Salmon was reunited with the people of the north Tacoma neighborhood and Tacoma business district representatives. 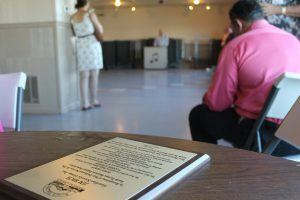 The group included former city councilman Bill Evans, who first helped to introduce the $10,000 art installation back in 2001, before Old Town Salmon’s mysterious disappearance in 2006. 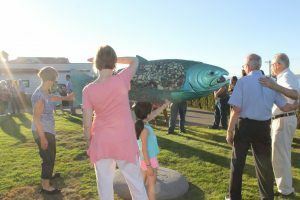 Ten years later, the 8-foot fish was officially welcomed back into the community and “unveiled” during the Experience Tacoma (CDA) summer social, an annual event honoring hard working liaisons within and across business districts in our city. Key players like Bill Evans, with wife Anne, were quite sentimental over the long awaited homecoming following the Salmon’s disappearance. The fish had been unexpectedly recovered in its neighborhood two weeks prior to the event. 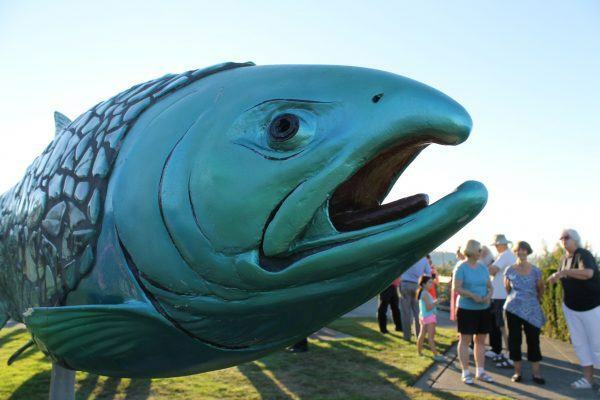 Left with the 150-pound sculpture was a peculiar note stating simply that it was time for the fish to return. The large sculpture is in good condition aside from some chipping paint. However, fine details like the image of founding father Job Carr, can still be admired through the collage of reflective glass on the Salmon’s side. Bill attested to his excitement and gratitude in seeing the fish return to its rightful place after all these years. 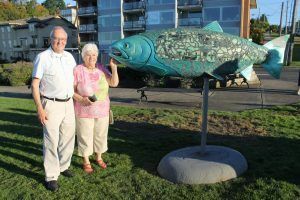 He distinguishes this particular salmon as the most historic of the 10 original installations, being as it sits on the original stretch of Tacoma. (Learn more about Old Town and Job Carr here). 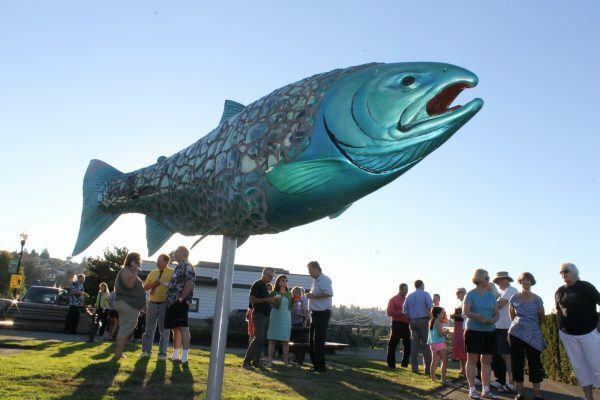 You can now see the Old Town Soul Salmon glinting in the sun outside of the Old Town Music Society in Gateway Park, where it once again greets the Puyallup River flowing into the mouth of Commencement Bay. For more details on the Old Town Soul Salmon, read the full length story by the Tacoma News Tribune.